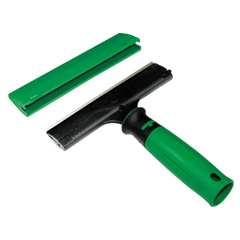 Durable scraper is ideal for everyday glass cleaning. Comfortable, lightweight ergonomic design. Use as a handheld scraper, or lock into any Unger® poles with locking cone. 6" wide blade. Replacement blades (UNGTR15) sold separately.